Natural vegetation maps show Vancouver Island and the neighboring mainland as mostly covered by a heavy forest. That forest, however, has with few exceptions been thoroughly butchered in the last century. As one young Canadian said with gallows humor: "so many trees, so little time." Logging in the Pacific Northwest began on sites close to navigable waterways, which is why maps from 1900 show a distinctive pattern of logged land as a fringe or ruff on mainland and island shores. There's been a lot of recovery in the ensuing century. 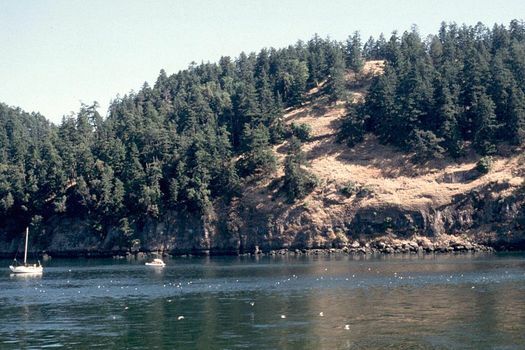 Here, secondary forest recovers on one of the Gulf Islands fronting Active Pass, between Victoria and Vancouver. 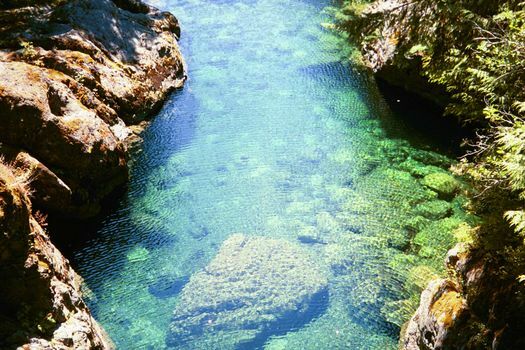 Broader opportunities awaited loggers on Vancouver Island, which a century ago offered a swath of timber 300 miles long, north to south. 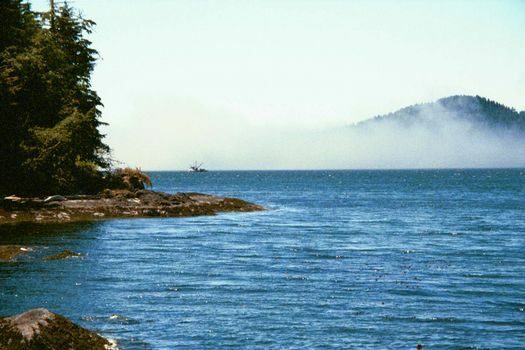 Here, a fishboat heads into the nearly perpetual fog bank off Port Renfrew, on the island's southern west coast. 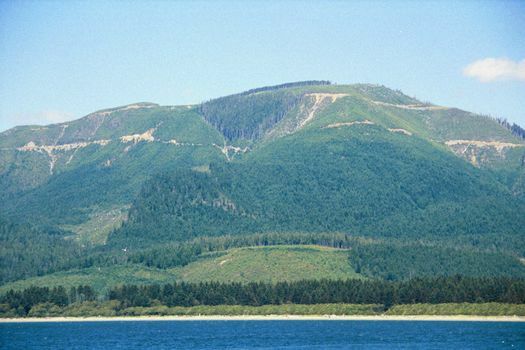 Looking east from the same position: the clearcut island mountains. 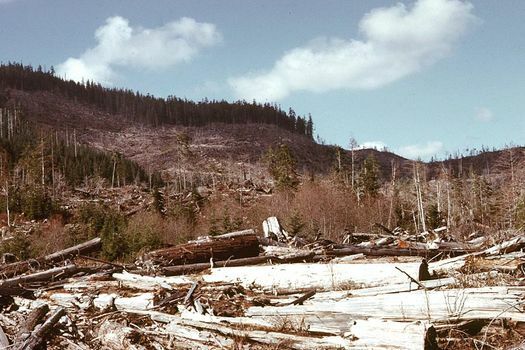 Looks a lot like coastal Oregon and Washington, but this is all Crown land, and private companies like Weyerhaeuser own only cutting rights, not the land itself. 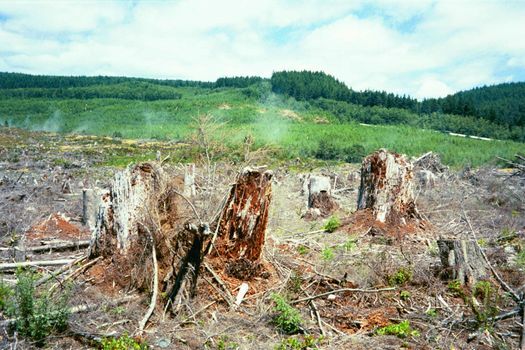 In theory, this should have kept the land in better condition than the private industrial forestry lands of the United States, but it hasn't worked out that way. Bit by bit, load by load. A lot of wood gets left behind. 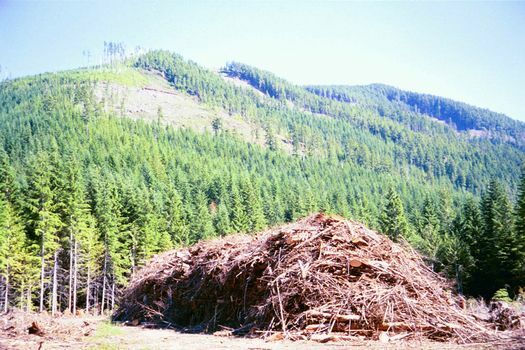 The non-merchantable wood is piled and eventually burned. Does the land recover? 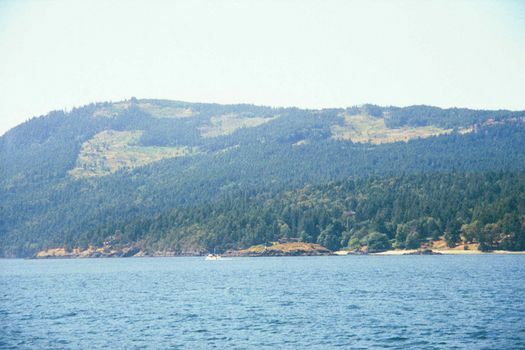 This picture was taken south of Cowichan Lake about 1970. The photographer thought the land was done for, but by 2000 the same view was hidden by regrowth on all except a few rocky ledges. 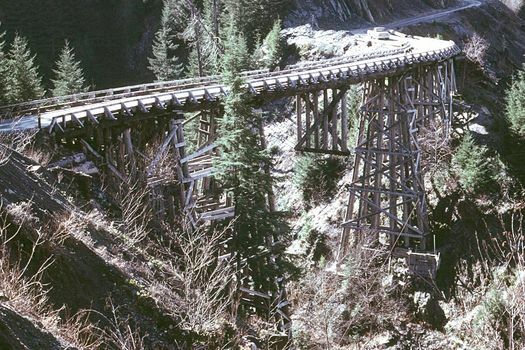 The logging infrastructure, on the other hand, disappears quickly, like this rotting railway trestle west of Lake Shawnigan, still on Vancouver Island. 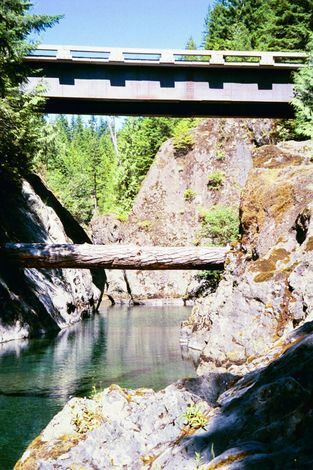 Trucks replaced railways in the 1950s and stimulated the imagination of engineers who contrived structures like this inverted suspension bridge. 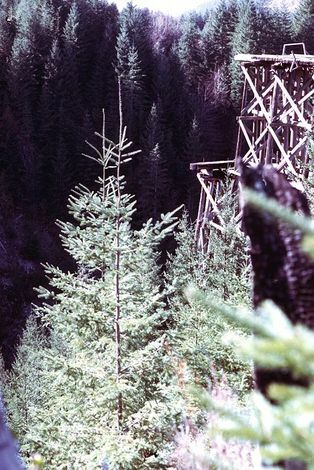 The idea of preserving parts of the forest eventually arrived. 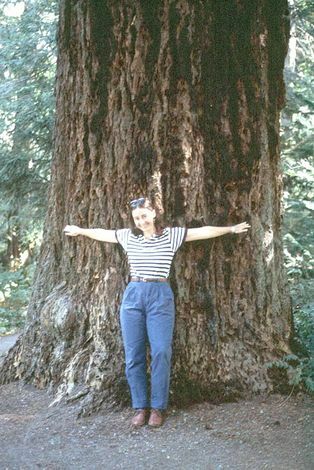 This is an early but tiny case: the so-called Cathedral Grove, now part of the H.R. Macmillan Provincial Park. Macmillan was a pioneer industrial lumberman, and it is said that this grove, a few miles east of Port Alberni, survived not from sentiment but because many of the trees were so internally rotten that were were commercially useless. A more representative sample of the island: cut and cut again. 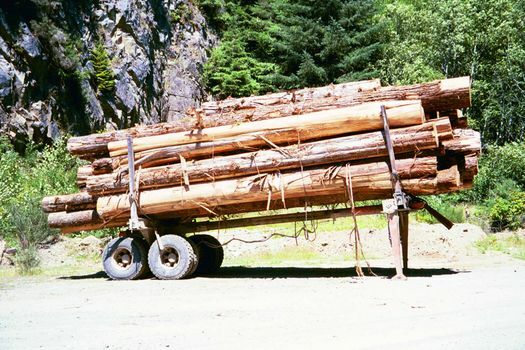 The idea of forest trees as a crop has appealed to foresters for a century or more, but it's increasingly hard to sell to the public--except in logging towns, of course. 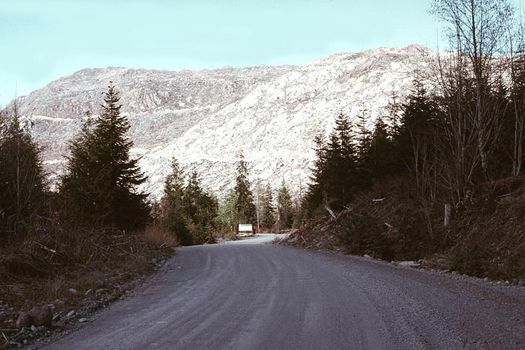 Back in the same mountains, a logging road crosses Hemmingson Creek, south of Cowichan Lake. Park-grade scenery. The water is intensely cold, deep, and amazingly clear, considering how much logging has taken place upstream. Wouldn't you expect a river choked with silt?